a hormone secreted by cells of the hypothalamic nuclei and stored in the posterior pituitary for release as necessary; it stimulates contraction of the muscular tissues of the capillaries and arterioles, raising the blood pressure, and increases peristalsis, exerts some influence on the uterus, and influences resorption of water by the kidney tubules, resulting in concentration of urine. Its rate of secretion is regulated chiefly by the osmolarity of the plasma. Also prepared synthetically or obtained from the posterior pituitary of domestic animals; used as an antidiuretic. Called also antidiuretic hormone. Vasopressin (ADH) regulation. ADH is secreted by the posterior pituitary gland primarily in response to an increase in plasma osmolality. From Malarkey and McMorrow, 2000.
arginine vasopressin vasopressin containing arginine, as that from humans and most other mammals; for medicinal uses, see vasopressin. Called also argipressin. lysine vasopressin the antidiuretic hormone of the pig family, differing from arginine vasopressin in having lysine instead of arginine at position 8. A synthetic preparation, lypressin, is used as an antidiuretic and vasoconstrictor. A nonapeptide neurohypophysial hormone related to oxytocin and vasotocin; synthetically prepared or obtained from the posterior lobe of the pituitary of healthy domestic animals. In pharmacologic doses vasopressin causes water retention and contraction of smooth muscle, notably that of all blood vessels; large doses may produce cerebral or coronary arterial spasm. /vaso·pres·sin/ (-pres´in) a hormone secreted by cells of the hypothalamic nuclei and stored in the posterior pituitary for release as necessary; it constricts blood vessels, raising the blood pressure, and increases peristalsis, exerts some influence on the uterus, and influences resorption of water by the kidney tubules, resulting in concentration of urine. In most mammals, including humans, it exists as the arginine form, a synthetic preparation of which is used as an antidiuretic and in tests of hypothalamo-neurohypophysial-renal function in the diagnosis of central diabetes insipidus. A lysine form occurs in pigs; the synthetic pharmaceutical preparation is lypressin. A hormone secreted by the posterior lobe of the pituitary gland that constricts blood vessels, raises blood pressure, and reduces excretion of urine. Also called antidiuretic hormone. A nonapeptide neurohypophysial hormone related to oxytocin and vasotocin; synthetically prepared or obtained from the posterior lobe of the pituitary of healthy domestic animals. In pharmacologic doses, vasopressin causes contraction of smooth muscle, notably that of all blood vessels; large doses may produce cerebral or coronary arterial spasm. A hormone secreted in the HYPOTHALAMUS and stored in and released from the PITUITARY GLAND. Vasopressin controls water retention by the kidneys and thus the water content of the body. Deficiency of vasopressin causes DIABETES INSIPIDUS. A hormone that acts on the kidneys to regulate water balance. syn vasopressin, neuroendocrine secretion from the posterior pituitary; acts in the kidneys to increase the retention of water when body fluid osmolality increases, e.g. with excessive sweat loss when fluid is not adequately replaced. See also hydration status, hypothalamus, osmoreceptors, thirst, water balance; Table 1. Pineal body Melatonin Widespread, including brain, thymus, etc. Calcium and phosphorus absorption, secretion and turnover in bone. sensation arising when there is body fluid depletion, in response to increase in local osmolality in the hypothalamus and to neural and hormonal signals related to decreased blood volume and/or blood pressure; accompanied by production by cells in the hypothalamus of the water-retaining antidiuretic hormone (ADH) and its release from the posterior pituitary. not itself the site of hormone synthesis, but the site of release of hormones formed in the hypothalamus by neurons whose axons form the hypophyseal-pituitary tract, store the hormones in their terminals, and release them into the blood stream in response to action potentials (neurohormones: compare adrenal medulla). antidiuretic hormone ( syn vasopressin ) regulates water loss in the kidneys, by increasing water retention; oxytocin stimulates uterine contractions and the ejection of milk from the breasts. See also hormones; Table 1.
cells located in the hypothalamus, sensitive to a change in the osmolality of their surroundings, which will reflect any such change in the plasma and body fluids as a whole. A rise in osmolality (tending towards dehydration) triggers increased production and release of antidiuretic hormone (ADH) from the posterior pituitary (a neuroendocrine secretion), causing the kidneys to retain more water. Conversely, a decrease in body fluid osmolality (due to high water intake) reduces ADH release, leading to increased and less concentrated urine output (diuresis). region of the brain which links cerebral function to the endocrine system, initiates physio logical responses to emotions and regulates eating and drinking behaviour, body temperature and circadian rhythms. Many of these actions are mediated via the autonomic nervous system. Secretes specific 'releasing' and 'inhibitory' hormones into local blood vessels that reach the anterior pituitary and influence the secretion of its hormones; also the neurohormones oxytocin and antidiuretic hormone (vasopressin) are formed here in nerve cell bodies and travel down axons in the hypothalamo-hypophyseal tract to be stored in, until released from, their terminals in the posterior pituitary. See also appetite, body temperature, hormones, thirst. Nonapeptide neurohypophysial hormone related to oxytocin and vasotocin. a hormone secreted by cells of the hypothalamic nuclei and stored in the posterior pituitary for release as necessary; it stimulates contraction of the muscular tissues of the capillaries and arterioles, raising the blood pressure, and increases peristalsis, exerts some influence on the uterus, and influences resorption of water by the kidney tubules, resulting in concentration of urine. 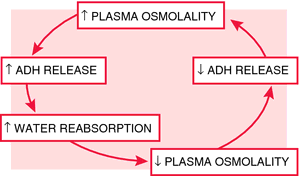 Its rate of secretion is regulated chiefly by the osmolarity of the plasma. Also prepared synthetically or obtained from the posterior pituitary of domestic animals; used as an antidiuretic. Called also antidiuretic hormone (ADH). see antidiuretic hormone response test.